Ensign, J. 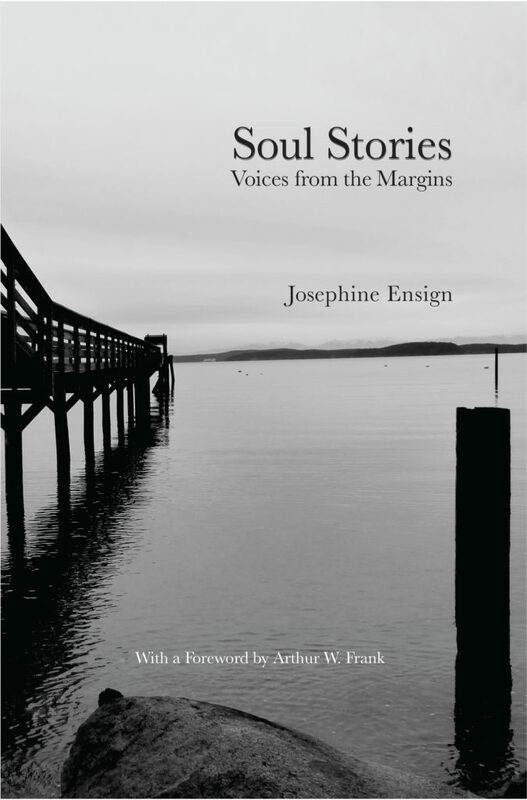 (July 16, 2018) Soul Stories: Voices from the Margins (San Fransisco: University of California Medical Humanities Press). Ensign, J. (February 23, 2018) “Chaos” mixed media art published in Pulse: Voices From the Heart of Medicine. Ensign, J. (February 7, 2018). “Witnessing the Power of Story” in Columbia University’s Intima: A Journal of Narrative Medicine, Crossroads. Ensign, J. (Fall 2017) “Witness: On Telling“ in Columbia University’s Intima: A Journal of Narrative Medicine. Ensign, J. (June 22, 2017) “The Hospital on Profanity Hill—A History of Harborview Hospital (Seattle)” in HistoryLink.org, essay #20393. Ensign, J. (February 2017) “Degree of Latitude” in Manifest-Station. Ensign, J. (November 2016) “Listen, Carefully” in Electric Literature/Okey-Panky. Ensign, J. (Fall 2016) “Way Out; Way Home” in Raven Chronicles Journal vol. 23: Jack Straw Writers Program, 1997-2016. Ensign, J. (August 2016) Catching Homelessness: A Nurse’s Story of Falling Through the Safety Net (Berkeley: She Writes Press). Named the University of Washington Health Sciences Common Book for academic year 2016/2017. Named the American Journal of Nursing 2017 Book of the Year for creative works. Ensign, J. (Spring 2016) “Medical Maze” in Columbia University’s Intima: A Journal of Narrative Medicine. Ensign, J. (May 2016). “Greyhound Therapy” in the Front Porch Journal, Issue 32. Ensign, J. (Winter 2015). “Listen Carefully” 55-word story included in Perspectives in Biology and Medicine, Special Issue: Diagnosis, Johns Hopkins University Press, p. 32. Ensign, J. (June 2015) “Fossicking the Ten Essentials” published in Traveler’s Tales/Travel to Go, Number 16. Here is a link to the pdf version of the entire essay: “Fossicking the Ten Essentials.” And by-the-way, fossicking is an Australian and New Zealand term for ‘rummaging’ and ‘prospecting,’and specifically for ‘picking over the abandoned workings’ (of gold, precious stones, and fossils). Ensign, J. (Spring 2015) “The Hospital on Profanity Hill” published in Hektoen International. Ensign, J. (June 19, 2014) “It Was Time to Proclaim Myself a Wounded Healer” (repost of essay below). KevinMD. Ensign, J. (May 30, 2014) “No Place Like Home(less)” essay published in Pulse: Voices From the Heart of Medicine. Albert Einstein College of Medicine. (Reprinted on KevinMD). Ensign, J. (Spring 2014) “Steps to Footcare” (fiction) published in Intima: A Journal of Narrative Medicine. Columbia University Program of Narrative Medicine. Ensign, J. (May 17, 2013) “On the Road” essay published in Pulse: Voices From the Heart of Medicine. Albert Einstein College of Medicine. Ensign, J. (May 2013) “Soul Story” essay published in Jack Straw Writers Anthology, volume 17. Jack Straw interview and reading here. Ensign, J. (April 2013) “Next of Kin” essay in the anthology I Wasn’t Strong Like This When I Started Out: True Stories of Becoming a Nurse, edited by Lee Gutkind, In Truth Press. Ensign, J. (Spring 2013). Home Death. Johns Hopkins Public Health Magazine. Ensign, J. (November 2012). Homeless Ghosts. University of Iowa‘s Examined Life Journal. Ensign, J. (April 2011). Reprint/excerpt of Gone South in The Daily Palette, University of Iowa. Ensign, J. (Spring 2011). Gone South. Silk Road, v6.1, pp 8-16. Ensign, J. (November 2000). Sibling Rivalry. The Sun. Ensign (Bowdler), J. (1989) Touched by AIDS. Oberlin Alumni Magazine. Ensign, BJ. (1979). Waldamere and Wally. Parents Anonymous of Delaware. Ensign, J. and Ammerman, S.(2008). Ethical Issues in Research with Homeless Youths. Journal of Advanced Nursing. 62(3):365-372. Ensign, J. (2004). Quality of care: The views of homeless youth. Health Services Research. 39(4):695-708. Ensign, J & Bell, M. (2004). EnsignBell2004 Qualitative Health Research. 14(9):1239-1254. Ensign, J & Panke, A. (2002). Bridges and barriers to care: Voices of homeless female adolescent youth in Seattle, Washington, USA. Journal of Advanced Nursing. 37(2):166-172. Barry, P., Ensign, J, Lipke, S. (2002). Embracing street culture: Fitting health care into the lives of street youth. Journal of Transcultural Nursing. 13(2):145-152. Ensign, J. (2001). “Shut up and listen”: Feminist health care with out-of-the-mainstream adolescent females. Issues in Comprehensive Pediatric Nursing. 24(2):71-84. Do you write anywhere about finding your voice? How did this come to be a writing practice for you? In my own ten year journey through brain injury, autoimmune disease, and homelessness, I’ve kept Helene Cixous as a touch stone. I used my training as an actor to place myself in my own, fractured narrative. I used my work as a rehabilitative horse trainer to explore the uses of constraint as a tool for my own healing. And I used my experience as a standardized patient to gain traction in clinical settings that have no algorithm for me. But it was the voice in my head that whispered itraconazole that finally cracked the ddx I had to work alone. And until I read you, I thought I was the only person in the world to think about, and write about my experience this way.